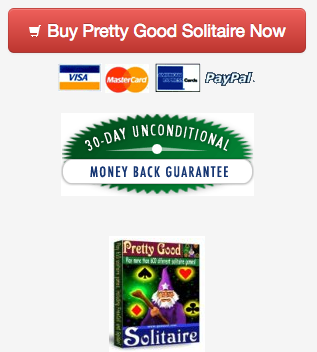 A new version of Pretty Good Solitaire is now available. Version 14.3 adds 10 new games for a total of 830 games. The new games are Bell Towers (variation of Towers), Catalan (variation of Spanish Patience and Castles in Spain), Double Bisley (2 deck version of Bisley), Double Vertical (2 deck version of Vertical), Klondike 13 (a variation of Fifteen Rush), Prince Albert (similar to King Albert), Romanian Solitaire (similar to Ukrainian Solitaire), Silver Mine (a variation of Gold Mine), Tasmanian Patience (a variation of Australian Patience), and XV (an addition game where ranks add to 15). A new version of Pretty Good Solitaire for iPad is now available! If you have purchased the app, go to the App Store Updates area, the update should be there. Version 14.2 adds 10 new games for a total of 820 games. The new games are Carlton Cell (variation of Carlton), EastCliff (variation of WestCliff), Forty Pirates (a version of Forty Thieves), Lake Victoria and Nile (both new addition type games), Osmosis Deal 3 (a variation of Osmosis), Persian Rug (a variation of Crazy Quilt), Quadruple Klondike Strict (variation of Quadruple Klondike), Rectangular and Triangular (both new games that build down regardless of suit). Version 14.2 also adds new background images, increasing the number of included images from 56 to 100. 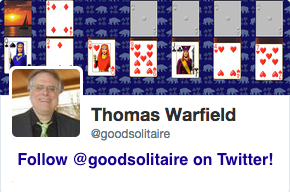 A new version 2.50 of Pretty Good Solitaire Mac Edition has just been released! Pretty Good Solitaire Mac Edition includes 500 games - see http://www.goodsol.com/mac for full details. This is a free update for all registered users - if you have the full version installed, just start the game, go to the Internet menu, select "Download Latest Version". You will then be able to download the full version. Version 13.4 adds 2 new games for a total of 792 games. With this version we are switching to a new release schedule - approximately every month there will be a new version. There will be fewer new games in each version of course, but regular new games and fixes each month.